In honor of the two months of birdie fun we’re having here at KatersAcres, here’s another classic fun figurine that you can make to enjoy yourself! 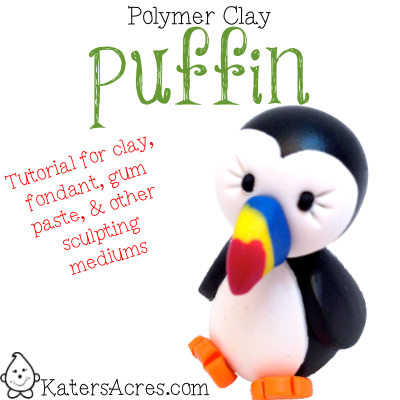 This DIY polymer clay puffin tutorial is perfect for beginners and advanced artists alike. Using 1/4 bar of black clay: cut the piece into 1/3 and 2/3 piece. 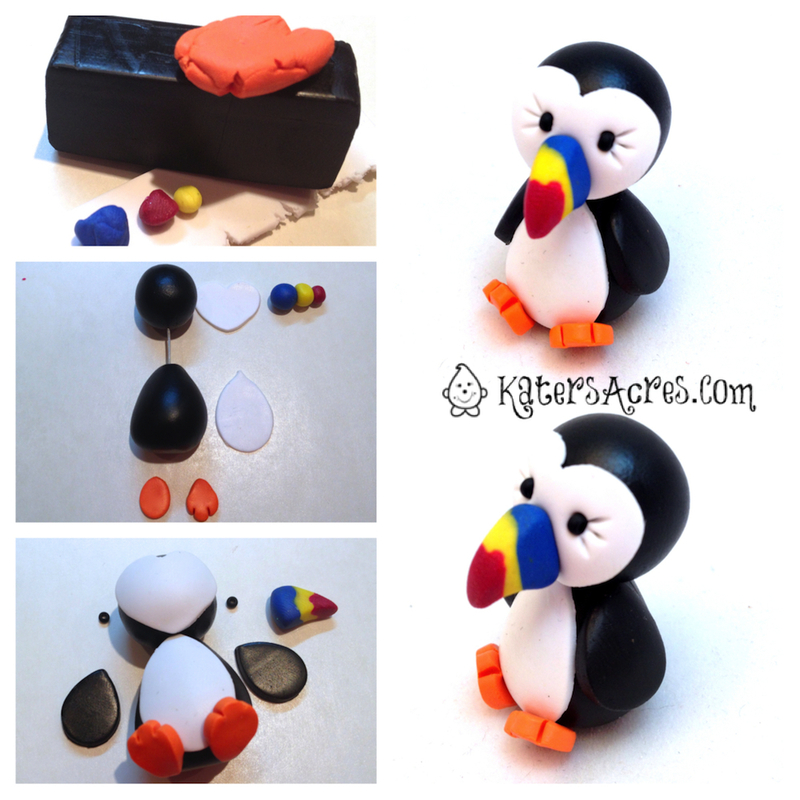 Condition & shape the 2/3 size piece of black clay into a teardrop shape for the puffins body. Condition & shape the 1/3 piece of black clay into a circle for the puffins head. Run the clay through the 3rd smallest setting on your pasta machine. Using Kemper Cutters, cut a tear drop & heart shape. Attach the heart shape to your penguin’s head. Attach the tear drop shape to your penguin’s body. Insert a piece of wire or toothpick into the teardrop bottom of your penguin and push the head onto the body with the wire/toothpick in the center to secure. Using about 1/8 block of the remaining black clay, condition and roll to a medium setting on your pasta machine. Using Kemper cutters, cut two teardrop shapes. Position on the Puffin’s side, next to his white belly. You decide on the size of the beak appropriate for the bird you are making. Roll three small balls of Premo clay: blue, yellow, & red as shown in the photograph. Roll the three balls together to form a snake. Using a “smoosh” action shape the snake back into a triangle shape. Shape the triangle into a gently sloping beak as show in the photograph. Attach to the birds head for his beak. Insert black seed beads or gemstone beads using a needle tool. Make a ball from your orange clay and form into a tear drop (or use Kemper Cutters for the shape). Using a sharp knife or needle tool, make two cuts in the teardrop to form the toes of the Puffin. Attach to the bottom of your puffin and make it cute like he’s “kicking” or something! Make sure to press everything together to hold. Puffins are my most favorite animals of all times! I collect puffin stuff and all my friends and family know of my puffin addiction! I hope to be able to make this cutie…thanks for sharing. What a cute Puffin Katie!